I've been a fan of self-taught artist Charmaine Olivia for a good few years now. I love that through following her on the internet, I can catch a glimpse of items that inspire her and the environment in which she works. I think that this insight into the production of art results in a more in depth connection with the finished piece. When I first found her work, her pieces comprised of sketches of girls and birds with geometric patterns overlapping them. This transformed into dark and ethereal celebration of femininity through portraits of mystical women, and more recently she has been experimenting with an explosion of colour, manifested through the vibrant flowers that now adorn the hair of her female subjects. I've personally found it extremely interesting following the work of current artists online and can't help but wonder what it would have been like to track the artistic progression of individuals such as Picasso and Van Gogh if they lived today and shared their work online. 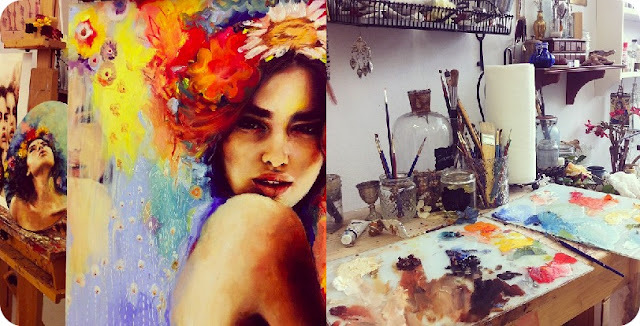 All images belong to Charmaine Olivia. 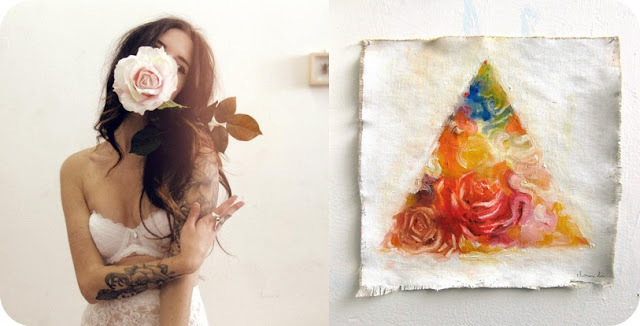 You can find out more about Charmaine Olivia on her website, tumblr and facebook. pretty pretty pretty love it! Oh, those are very pretty.